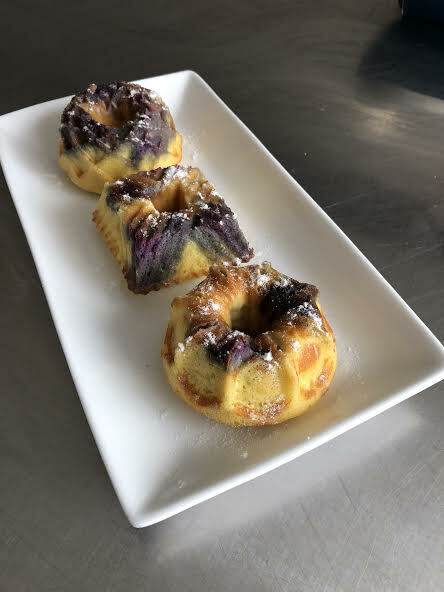 These Keto Blueberry Lemon Cakes are gorgeous and irresistible and keto of course. I was so happy with how these turned out. The lemon zest adds just the right amount of freshness . Blueberries are my favorite fruit, and they add an unexpected purple-blue swirl that make these cakes look like a work of art. Serve these at a summer brunch or bring them to a friend for a special occasion. 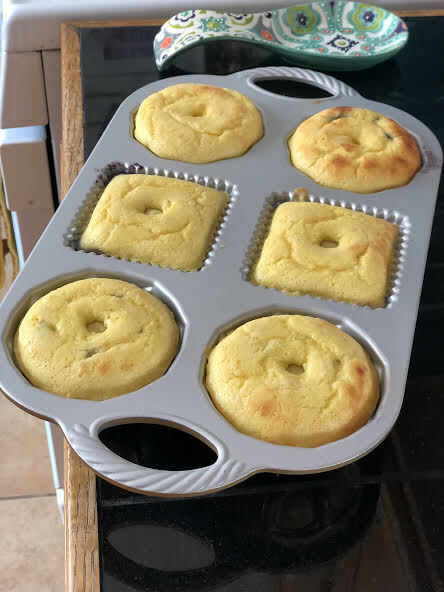 These keto cakes deserve to be shown off. I love my Baby Bundt Cake Pan from Sur La Table. 1. Preheat the oven to 425ºF. You can coat your bundt pans with cooking spray if you want, but I don't because the butter you melt in them in the next step keeps them from sticking. 2. Place the 4 pieces of butter in the baking pan and place in oven for 2 to 3 minutes to melt the butter. Let the butter melt, but make sure it doesn’t brown or burn. Remove from the oven. 3. 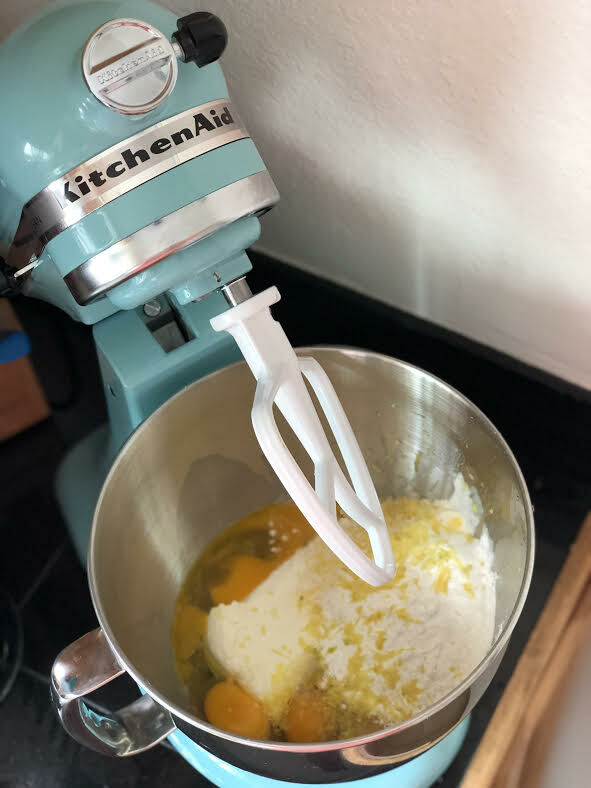 In a food processor, mixer or blender, process the eggs, cream cheese, coconut flour, sweetener, baking powder, and lemon zest, until thoroughly combined. 4. Pour the batter into the baking pan with the melted butter. 5. Drop the blueberries into the cake, evenly spreading throughout. Be Careful not to add too many blueberries or the bottom of the cake will be mushy. 6. Bake for 15 minutes, or until toothpick inserted into the center comes out clean. 7. Allow bundts to cool on a rack. You can serve warm or cooled. I sprinkled confectioners Swerve on top of mine. TIP: If the blueberries do cause the top to be a little soft, you can place bundts on a baking sheet and place back in the oven for a few minutes to "dry out" a bit. I did that for these. 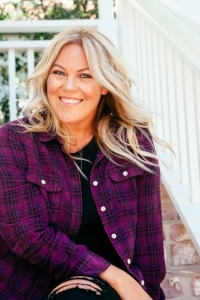 You can find Swerve and some of my other favorite products on my Amazon Store. KETO RECIPE: KETO BIRTHDAY CAKE!